The women started posing for each other. While I conducted my first interview, in Bwindi, the Batwa woman gave me the gift of her story of time. It is a great story that I have included in another blog post. At the end of the story I wanted to take a picture of the beautiful woman. She claimed to be 100 years old, had a slow but steady walk and her bare feet were firmly planted on the ground. I wanted to always see her face and to share her image with you. Unfortunately she declined my request for a picture. I understood but was disappointed. As explained by my translator, the people have had their pictures taken by many people and they have never seen a single image. Their fear is that other people are making money off their pictures and they are getting nothing. I understand that and have indeed seen this happen. Or at least appear to happen, since I don’t know what individual photographers do with their images. When I visited a school of Batwa women and children on my last day, I was amazed that they eagerly wanted their pictures taken. They eagerly held their hand to their eye, forming a circle around their eye and then gesturing to their chest. I quickly accepted the invitation. I began taking pictures of the women, their children, and finally of the class. As I showed them the picture on the screen, they eagerly took the camera to capture a picture of me with the students. Quickly, they began lining up for each other, taking pictures of each other. Striking a pose and laughing at each other. It was amazing to watch them review their pictures and show each other how to use the camera. This is the picture the woman in yellow took. How often are they given a chance to record their own stories? To record their own lives? While I understood at the beginning of that project the humility I needed to record their stories, it wasn’t until the end that I realized how much more powerful it is to enable them to record their own stories. 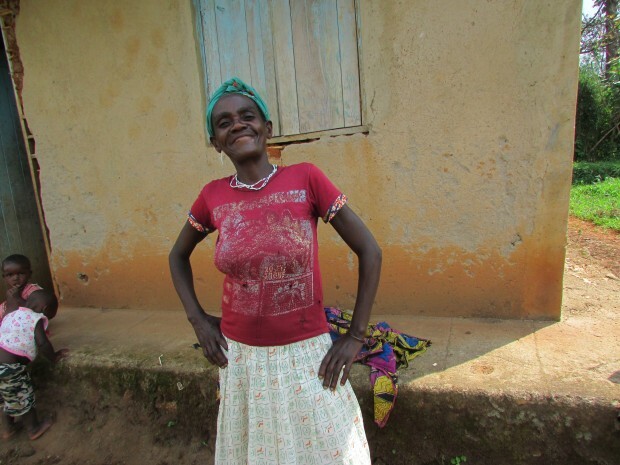 The purpose of much of the development work done with the Batwa, is done to empower the community to lead themselves. The Batwa have already begun to tell their own stories through the Batwa Experience, a living cultural museum established to pass their stories on to the younger generations in addition to the tourists. I understand the quandary that I have to come to help them tell their stories, but I hope that I am acting only as a megaphone and not as a gate keeper. 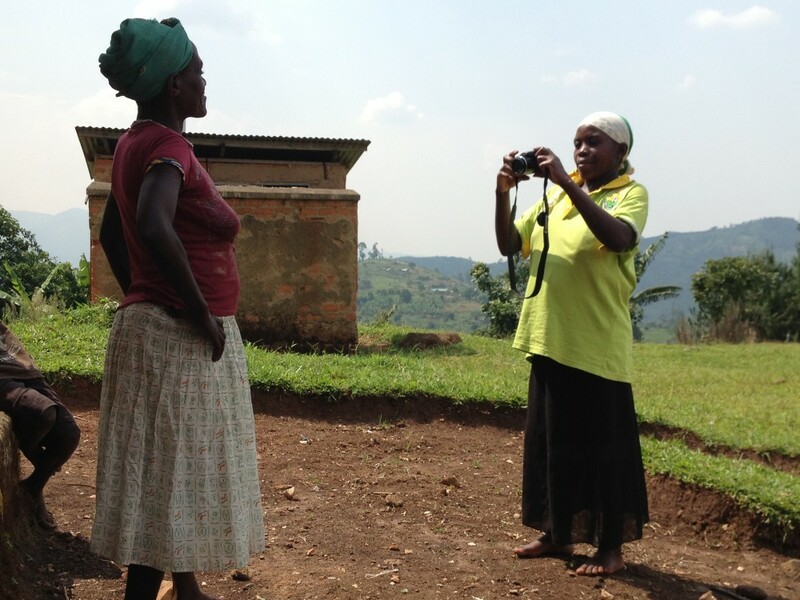 I left the images and some money in Bwindi to develop the pictures they took, I hope this gift helps them in their quest to tell their own stories. And I will remember the image of that first woman, regardless of me keeping her picture. I found a beautiful sacred space yesterday. It has been in use for over 100 years. It has no walls and yet it still shelters life. 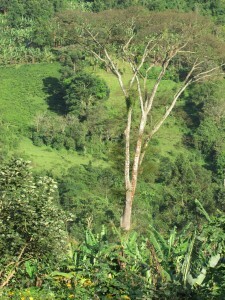 The giant fig tree (Ekitoma in the local Rukiga language , stands next to the playing field of the primary school. It has been a shrine, a school, a hospital, and a meeting place. The giant fig towers nearly 50 feet. Its trunk, a tangled swirl of vine and roots is 15 feet at its base. Until 1935, when Christianity had a stronger presence, the villages would bring offerings of honey and meat to wait the arrival of the great snake. They would gather around its base, leave offereings and dance waiting for its arrival. As Christianity made its creep along the continent eventually reaching this isolated village in the mountains of a deep rainforest, the villages stopped bring the offerings to the trees. A small church now stands 50 yards from the tree. Interestingly, at chapel this Sunday, someone brought an offering of millet along with the paper and metal offerings of Ugandan Shillings. In a farming and subsistence culture, offering some of your bounty will always continue. The tree became a school where children would meet with their teachers, learning english, history, and math. A school building was built in the same clearing. In 2003 a medical missionary named Scott Kellerman from Texas, came and held clinics under the giant fig tree. The clinics were to treat the Batwa (a pygme tribe ousted from the forest when it became a World Heritage site), eventually treating all the people from the village and surrounding community. Cases range from the simple and complex to the joyful and the tragic. They all came. The villagers eventually approached Kellerman about establishing a hospital. Kellerman asked the villagers to work together with all the leaders of the community and to gain wider community support. He partnered with Ugandan doctors and the Church of Uganda to help the community establish the Bwindi Community Hospital and the Kellerman Foundation. They now serve the entire community at the hospital, at 2 satellite sites, and by village health teams who travel to the villages 7 days a week. Now a nursing school is being built just a few minutes walk from the giant fig. The fig tree is again a gathering place for villagers. The Batwa gather here with tourists as they begin the ascent up the hill to the Batwa Cultural Center and living museum. A project of the Batwa Development Program, the cultural center is a series of tiny grass dwellings where the elders demonstrate for toursits their forest life, enabling them to also pass on the traditions to their youth. They gather in the waning light of day to share stories and teach. Much that sustains this community is within walking distance to this tree. The cry of new born babies, the voice of a teacher, the splashing of a creek, the rustle of banana leaves, the singing of hymns, can all be heard here. All that is essential to life is here within 10 minutes walk to this tree.